The 24-70 midrange zoom range is the bread and butter of many landscape photographers. As such, my Tamron 24-70mm F2.8 lens spent a lot of time attached to my camera. 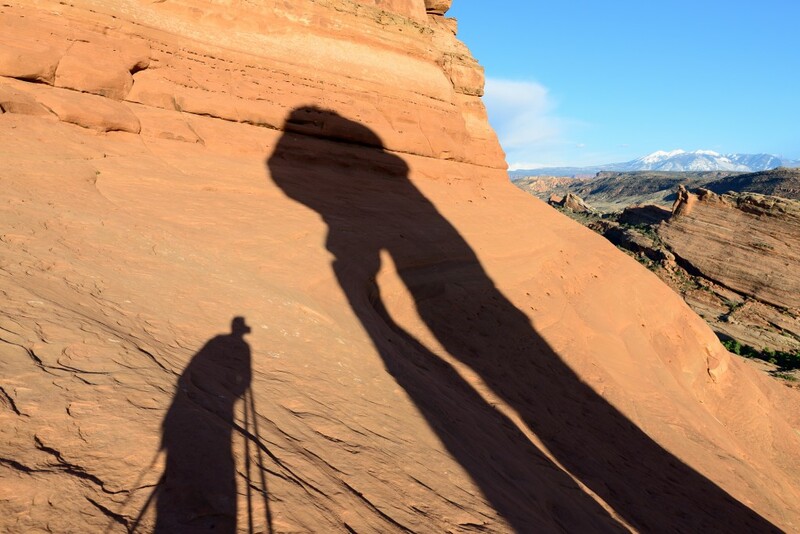 It was not only plenty sharp for landscapes when mounted on a tripod, but with its vibration compensation system and fast aperture it also made it great for handheld shots when needed as well. Despite its rather hefty size and weight, I pretty much always had it with me. 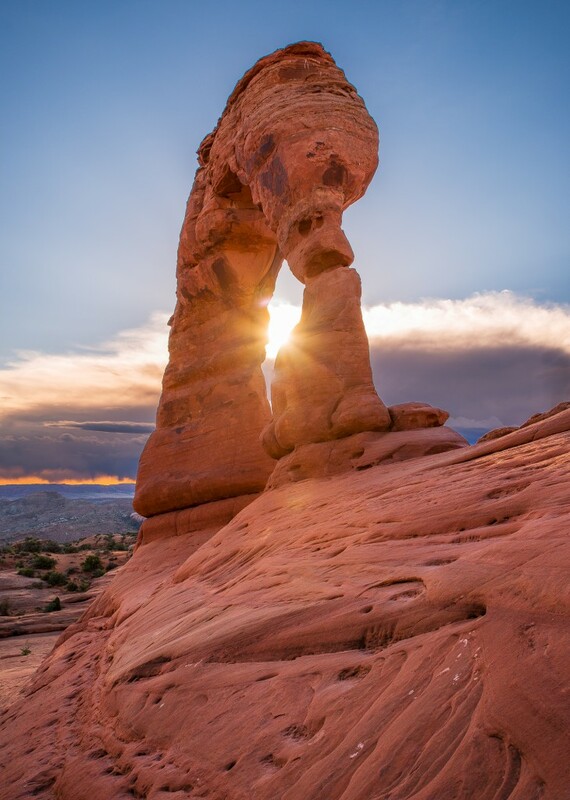 A hike up to Delicate Arch for some late afternoon/sunset photos as well as some scouting for my milky way shoot at night (which would later lead to this shot) was no exception, and the Tamron came along and quickly found itself attached to my camera. After some time spent scouting and hanging out with my family (my wife Stacie, baby Tyler, brother Brett, and sister-in-law Adrian all made the trip with me) I started shooting as the sun got lower in the sky, the Tamron attached the majority of the time. I was hoping to get some shots at sunset, but the storm clouds moving in both looked like they were going to make sunset a bust (they dipped below the horizon line) and looked too dangerous to have our 8 month old up on the mountain, so we started heading down. One of the last shots that my workhorse Tamron 24-70 would ever take. 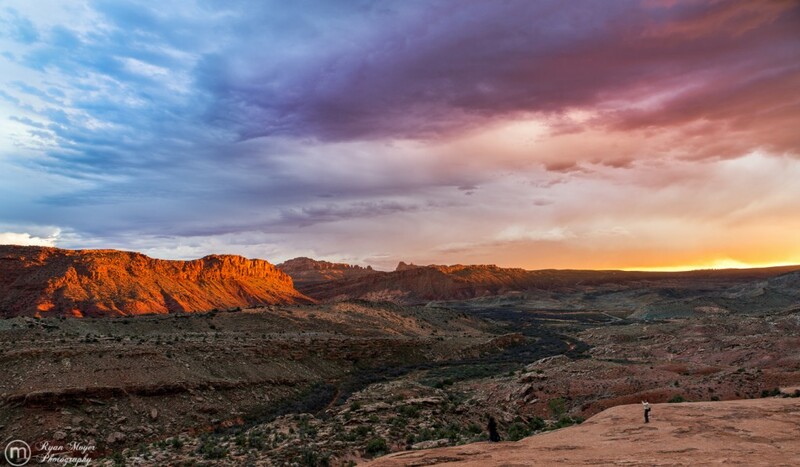 However, as we were about half-way down (in the middle of the slick rock section) the clouds parted just enough near the horizon line for the sun to break through, lighting up both the sky above us and the large red-rock cliffs in front of us. With the sun already right on the horizon, I knew the light on the cliffs wouldn’t last long and all of my gear was packed up in my backpack. I rushed to get everything set up for the shot, and in my haste to get everything prepared quickly I did not pull the tripod legs on my Gitzo 3542LS out all the way, leaving the legs too close together and the tripod unstable. I did not realize my mistake, and after taking a few shots I compounded the mistake by turning my back to the camera, just for a second, right as a wind gust blew in. With the heavy camera (D800E) and lens on top of the incorrectly set-up tripod, the wind was too much for it to handle and it tipped over to the ground. Immediately, I knew things were bad as I heard the shatter and could see broken glass on the ground. The camera had tipped forward and landed right on the front element of the Tamron 24-70 lens. Probably luckily, the Tamron absorbed all of the force of the blow and the camera was fine, not even scratched. The lens was not so lucky. 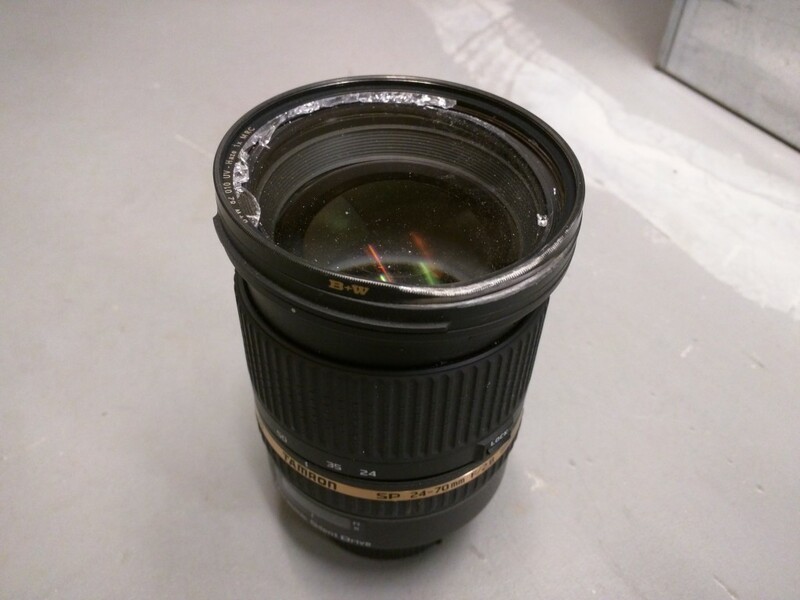 It turns out that the broken glass came from the UV filter on the front, but the lens took plenty of pain as well. It was bent badly, with the now glassless UV filter permanently stuck to the lens. Additionally, it will no longer focus or zoom as the whole lens is noticeably bent. So was it worth getting the shot? Maybe. The shot is not a show-stopper or anything but it came out pretty well. I’d probably rather have saved the money of a replacement lens (I ended up with the Nikon 24-70 this time around) but at least the photo will last forever, which the lens would not have. And I learned a valuable lesson to always make sure your tripod is set up properly and stably. The very last shot my Tamron 24-70 ever took.